Nonsense, right? Wrong. 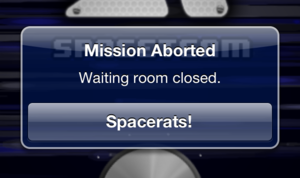 When it comes to the iOS game Spaceteam, these commands are the difference between life and death. Those who’ve ever watched an episode of Star Trek—any of the series, I’m not being picky—will find themselves right at home. The premise of the game is that you, and between one to three of your friends, are manning the bridge of a spaceship trying to outrun your horrendous, impending doom. Who's going to comfort me? 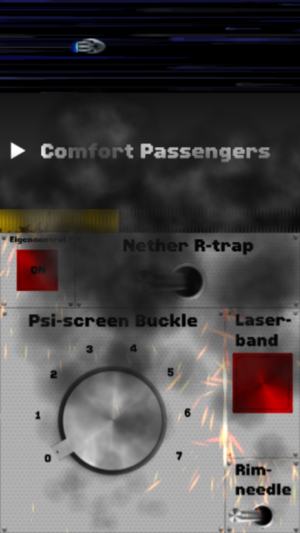 Spaceteam throws more and more challenges at you as you progress, including smoking and sparking panels. In each round (dubbed “sectors”), you’ll be presented with a control panel full of switches, buttons, knobs, sliders, and more. Above the control panel is a readout which tells you what command needs to be executed and shows a timer showing you how much time you have to perform that action. There are other challenges, too: Sometimes the commands are on your screen, which usually means that you end up looking sheepish after fervently yelling at your compatriots to set the infrared A-spectrum to 2. Asteroids hurtle at you, requiring you and your friends to all simultaneously shake your iPhones; wormholes, similarly, can be evaded when you all flip your devices upside down. Panels spark and swing loose (you can tap and drag them back into position), or are covered in slime that you have to wipe away with a finger. Labels are degraded, making them hard to read, or translated entirely into glyphs that have you shouting at your partners to, say, cycle the two people paddling the canoe. As the game progresses, the time you have to complete instructions gets tighter and tighter, and your entreaties to your friends only rise in pitch, volume, and urgency. The only graphics, aside from the panel, are on a small display at the top of the screen, which shows your ship trying to escape an exploding star. 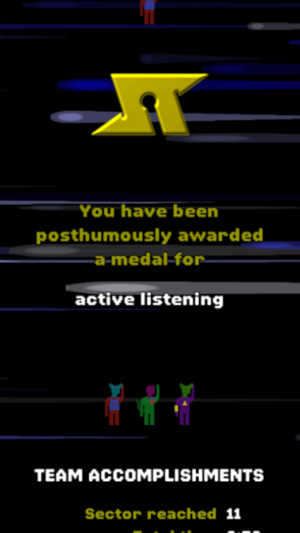 Stop, look, and listen: At the end of the game, you'll get an award and a list of your accomplishments. 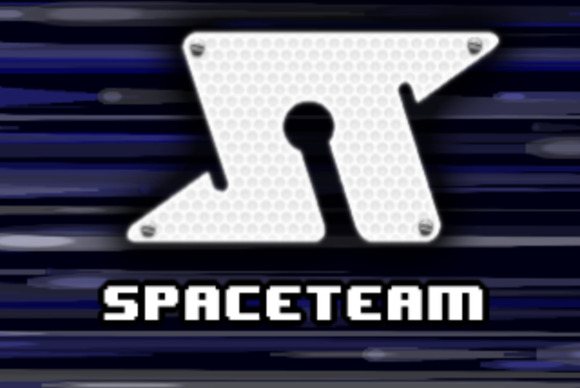 When you and your team lose—and you do inevitably lose, for Spaceteam is one of those games where the only reward for beating a level is a new, harder level—it’s usually, in my experience, amid peals of infectious laughter. At the end, you’ll get a few stats about your performance—such as how many times you adjusted controls unnecessarily, the number of disasters you averted, and how often you escaped near death. And you’ll get a posthumous award for whatever quality you evinced in the course of play, such as audacity, bravery, or, er, attendance. Spacerats! Occasionally, you'll run into connectivity glitches. They're usually easily fixed, but can sometimes disrupt your match. The game does have its occasional quirks: Since it’s multiplayer only, you’ll need to connect to your companions via Wi-Fi or Bluetooth, and those wireless connections can sometimes be finicky, requiring restarts of the app and fiddling with some settings. I’ve also had network connections drop in the midst of nailbiting play, announced with a disappointed “Spacerats” dialog box. Spaceteam’s free, but I give full credit to the developers behind the game for not succumbing to the strategy, exhibited by so many other companies, of having a “free” game that’s only really functional after buying a bundle of in-app purchases. There are in-app purchases in Spaceteam, but most of them are simply cosmetic—different designs for control panels and more outfit options for your little stick figures characters (who only appear in the game’s lobby); the exception is the Challenge Pack 1, an upgrade that includes both a Tenacious mode, which lets you up the difficulty by starting the game at sector 10, and Game Center achievements. But even buying those upgrades doesn’t functionally change the game, or give you an unfair advantage. Even so, I and several of my friends all shelled out the few dollars for upgrades anyway, for two reasons: first, because we wanted the extra features in question, and second, because any game as fun as Spaceteam deserves some of our money. Spaceteam’s level of challenge varies immensely, depending on the skills of your buddies—playing with one of my friends resulted in us repeatedly meeting our demise in sector six or seven; my eighteen-year-old cousin, on the other hand, helped get us to sector 13 on her first playthrough. What I like best about the game, though, is that—unlike so many games that force you and your fellow players to silently stare at your screens—Spaceteam actually engages you with your friends; it’s more like playing a good board game. And you’ll find that after a few attempts, you can actually beat that one level you thought was impossible. As long as you work together … as a spaceteam.